Self reflection is a beautiful gift which can help to ground us in our own reality. By pausing and wondering for just long enough our minds can become beautifully smooth, like the surface of a perfectly still pool, and we can make out our own faces and hearts shining back at us. The tendency is of course to keep going, to strive forwards towards an imagined goal, a goal which will bring fulfilment….but of course we never actually reach the goal. It teases us, always leading us on into the perfect future, like a rainbows end. Pausing and reflecting on how things actually are in this moment will release us from the eternal hunger of imagined future happiness. That happiness is here already, smiling back at us from the reflected depths of our souls. The true magic mirror lies within each of us, allowing us to see our own beautiful truths. Enjoy today and yourself just as you are, because that’s already enough and brimming over with infinite beauty. Take a look at more reflections at the WP Weekly Photo Challenge. 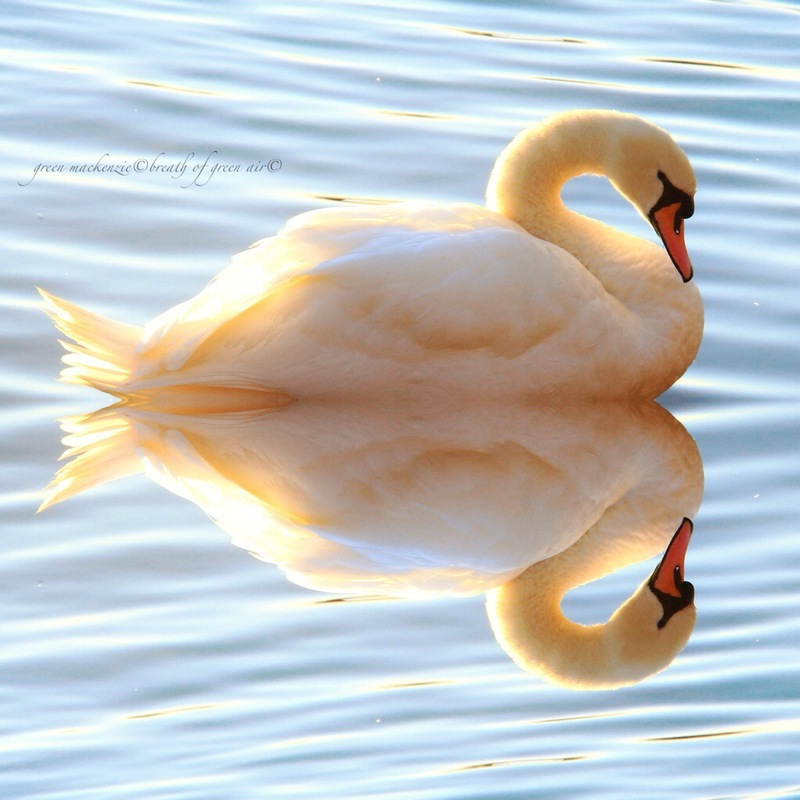 This entry was posted in art, change, mindfulness, nature photo, philosophy, photos, relaxation, spiritual, weekly photo challenge and tagged art, mindfulness, mirror, nature, photography, postaday, self-reflection, spiritual, swan. Bookmark the permalink. Wise words and stunning photo, Seonaid! Stunning image Seonaid, and beautiful words. Perfect beauty in the swan, the photo, the light and the water. And the wisdom coming with your words. Perfect. So serene, but paddling furiously underneath. Like many of us, sadly. Lovely post. The light in this image is stunning! Wow – stunning shot! And yes, self-reflection is good – even if uncomfortable sometimes when faced with our own truths. The swan Narcissus? Lovely photo and perfect for the challenge. But I always enjoy your photos. A truly wonderful photo. You are very gifted. Your words are inspirational. Thank you. Your photo is so lovely, it’s like a painting. And your words are great as well. But it’s very difficult to be like that, living in the moment, being happy in the moment. Sadly only few people live this way. Pingback: My Reflection Selfie | The Bohemian Rock Star's "Untitled Project"
Reblogged this on l i g h t w r i t e r s.
So wise… “that happiness is here already.” I read somewhere, & wish I had noted the author along with the observation: “The way to get what you want, is to want what you have.” The idea is to live with gratitude not greed, isn’t it. Beautiful photo and such true words. Beautiful swan, too! Thank you, Seonaid. I can see, as I said, perfect light….. Thanks Seonaid, I’ll try to keep your wise words in mind today. Absolutely wonderful capture Seonaid, and love your thoughts as well. You definitely made the most of this week’s challenge! Truly a beautiful post, it’s filled with wisdom! I love this photograph! 🙂 And your attitude, Seonaid! David I don’t think of complacency as the same thing as acceptance. Complacency to me feels as though I would be saying that what there is now is as good as it gets, the end point from which there is no further growth or change. Acceptance on the other hand always leaves me feeling that there’s more to come, another day filled with yet more wonder. I don’t see acceptance as giving in or resting on my laurels, but as a vibrant ongoing challenge to truly enter my life as it unfolds before me. Acceptance is about being real with ourselves and entering the reality and truth of our lives…..with all of our bumps and warts……allowing ourselves to feel happiness and sadness right now, and being open for each new moment that life fills to bursting and rolls towards us. Loads of true wisdom. Love to read your posts. Thank you, it makes me smile each time I look at it…..remembering the beautiful sunlight morning when I took it.